After one month in Cambodia (see previous post), I took a 7-hour bus from Phnom Penh to Ho Chi Minh City, Vietnam. Per Wikipedia, the Socialist Republic of Vietnam has historically been a relatively poor country with an economy based on agriculture, predominantly rice. However, about a decade following the reunification of north and south Vietnam and end of the Vietnam War in 1975, the country underwent significant economic and political reforms. As a result, Vietnam’s economic growth rate has been among the highest in the world since 2000. Along with rice production, manufacturing, high-tech industries, and oil production now form a large and fast-growing part of its economy. The country is currently the 8th largest crude petroleum producer in the Asia and Pacific region. And with this economic growth, poverty has declined significantly in Vietnam. Interestingly (to me anyway), about 30% of the population is irreligious (practicing no religion) with the remainder adhering to indigenous religions (~45%), Buddhism (~16%), Christianity (~8%), and other (~0.4%). So, how did I spend two months in Vietnam? Exploring the culture, history, and natural beauty of the country from south to north, and hanging out with friends of course. I arrived to Ho Chi Minh City, Vietnam’s largest city (population 8,224,400), during Tết Nguyên Đán or Vietnamese New Year. Per Wikipedia, Tết is celebrated during a roughly two week period around New Year’s Eve (in early February), with customs such as cooking special food, cleaning the house, visiting family and friends, worshipping ancestors, and giving lucky money to children and elderly people. Families also buy peach blossom, kumquat, and orange trees and flowers such as chrysanthemums or orchids to decorate their homes. New Year’s day is considered the first day of spring and the time to forget about the troubles of the past year and hope for a better upcoming year. Ho Chi Minh City and the other cities I visited during Tết were beautifully decorated with lights and hundreds of potted trees and plants in full bloom and felt very festive. While festive and full of flowers for the holiday, Ho Chi Minh City is a modern, bustling city with awe-inspiring traffic. The streets were a steadily moving river of scooters, dotted with some cars. Many of the major intersections have traffic signals but they are apparently optional and most drivers opt not to obey them. So, crossing the street is an exercise in faith, faith that the river of traffic will part around you as you slowly inch forward. And it works! While it appears chaotic at first, you realize quickly (after shadowing the locals a few times) that the traffic has a slow, steady flow that seems to adjust easily to constant interruptions by cross traffic. Nevertheless, street crossing felt like a sport and was a constant topic of conversation among us travelers. I improved my street-crossing skills by walking around town to visit some of the major sights, including the War Remnants Museum. This museum depicts the realities of the Vietnam War, referred to here as the American War, through graphic photographs taken by journalists, mostly Vietnamese but some American, European, etc. The exhibits also include graphic photographs and information about the use of agent orange and its multigenerational genetic effects on the soldiers, Vietnamese and American, and civilians who were exposed during the war. Needless to say, it was an educational but gut wrenching visit. While in Ho Chi Minh City, I also got to visit my friends, Bart and Juliet, an Australian couple I’d met on my Antarctic cruise in March 2015. It was so great to hang out with them and spend a few nights at their cozy flat. And since they’d been living there for the past two years, they took me to their favorite local eateries featuring delicious dishes such as pho (noodle soup), bun (rice vermicelli), banh my (sandwich), and a plethora of fresh seafood sauteed with fresh lemongrass and ginger. It was great to eat these familiar dishes in their country of origin while sitting among locals at tiny plastic tables on tiny plastic chairs. I also tried chè for the first time, a sweet beverage made with items such as mung beans, black-eyed peas, kidney beans, tapioca, jelly (clear or grass), fruit (i.e., longan, mango, durian, lychee, jackfruit), coconut, and coconut cream. Delicious! From Ho Chi Minh City, I visited the Mekong Delta, spending several days in the cities of Cam Tho (population 1,237,300) and My Tho (population 220,000). Per Wikipedia, the delta region encompasses a large portion of southwestern Vietnam, covering 15,000 sq mi (39,000 sq km), and is the country’s most productive region for agriculture (primarily rice) and fisheries. Like Ho Chi Minh City, these coastal cities were decorated for Tết and bustling with tourists (almost exclusively domestic) so it was fun to walk the streets lined with countless rows of blossoming trees and plants and people watch. 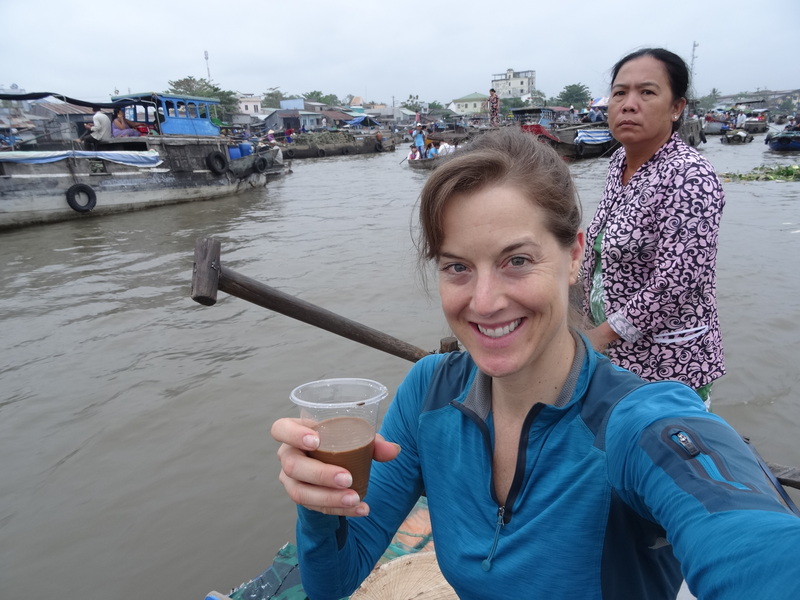 While in the delta, I also explored the nearby canals and a floating market via boat tour. Besides watching the buying and selling of produce boat to boat, it was fun to buy noodle soup from a floating restauant and coffee from a mobile coffee cart cruising by. 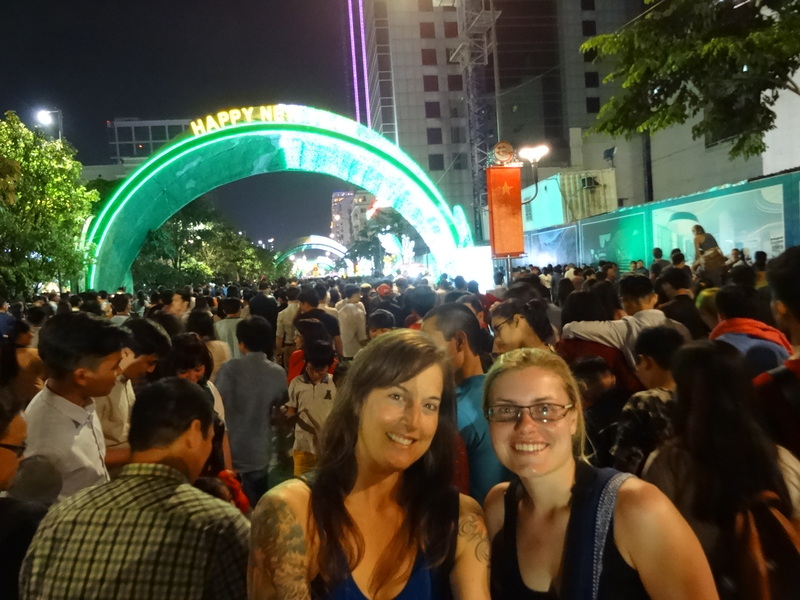 I returned to Ho Chi Minh City in time to join the masses (mostly locals) and Andrea (Czech Republic), who’d I’d met on my delta tour, to celebrate New Year’s Eve. We meandered the festively decorated streets and watched a live song and dance performance before a the midnight firework show. It was cool to celebrate New Year’s Eve twice, first in Siem Reap, Cambodia (December 31) and then in Ho Chi Minh City, Vietnam (February 7). After Ho Chi Minh City, I took the bus north, spending 2 to 3 nights in each of the cities of Dalat, Da Nang, Hoi An, Hue, and one night in Dong Hoi. Similar to Ho Chi Minh City and the delta towns, these cities were festively decorated for Tết and bustling with tourists (domestic and foreign). Dalat (population 209,301) is located in the central highlands, a region known for its beautiful lakes, pine forest covered mountains, and coffee plantations. [Did you know that Vietnam is second in the world behind Brazil for coffee production and export? Me either. And it’s delicious!] In Dalat, I visited Dat, brother of my friend and former housemate in California, Hung. I’d met Dat over 10 years ago when he visited Hung at our house in San Diego but hadn’t seen him since. Dat and his friends took me on a tour of some of the lovely areas outside of town. The next day, Vien (Dat’s friend) and Vien’s friends took me for a hike up Elephant Mountain where I was treated to a nice view of Dalat and a delicious BBQ including chicken wings and feet (yes, feet), sausage, potatoes, eggs, and bread. Later that night, Vien took me to Thi and Tuan’s home, two brothers who made and played classical guitars. It was cool to hear them play flamenco and traditional Vietnamese songs on the beautiful instruments they’d made. From Dalat, I traveled further north to the coastal city of Da Nang (population 1,007,400) where I explored the city, including the fire and water spitting Dragon Bridge and nearby Marble Mountain, with Sophia (Sweden), Lucy (UK), Sheri (UK), and Rich (UK). While there, I also hung out with Ly (who I also hadn’t seen since she and Dat visited Hung in San Diego over 10 years ago). She took me, Lucy, Sheri, and Rich to dinner at her friend’s new restaurant where we were joined by a group of her friends. It was a super fun evening of enjoying delicious food and drinking way too much beer with fun-loving people. You know it’s going to be a hell of a night when the locals, including the restaurant owner’s 70 year old mother, keeps chanting “mawt, hai, ba yo!” This chant, “one, two, three cheers” is the equivalent of “bottoms up.” I spent the next day hungover and unable to get out of bed but I’m betting grandma was just fine. Darn it!! After recovering, Rich and I went to Hoi An (population 121,716) and explored Ancient Town, a part of the city declared a UNESCO World Heritage site as a well-preserved example of a south-east Asian trading port of the 15th to 19th centuries, with buildings that display a unique blend of local and foreign influences. While parts of the Ancient Town were beautiful, it was extremely touristy and overrun by clothing shops and appeared to me to be losing its historic character. To escape, we bicycled and motorbiked to the quaint coastal villages nearby, watching as fisherman cast their nets and farmers tended to their lush green fields. Next, I took an overnight bus to Hue (population 340,000) where I stayed with Phuong, a friend of a friend I’d met in Dalat. Phuong introduced me to his friend, Phat, who took me out for a delicious dinner and more chè. Phuong also hosted a gathering of his friends, including Phat and Carla (Spain), where we sat around a fire, drank a few beers, ate fire-roasted potatoes and corn, and chatted. 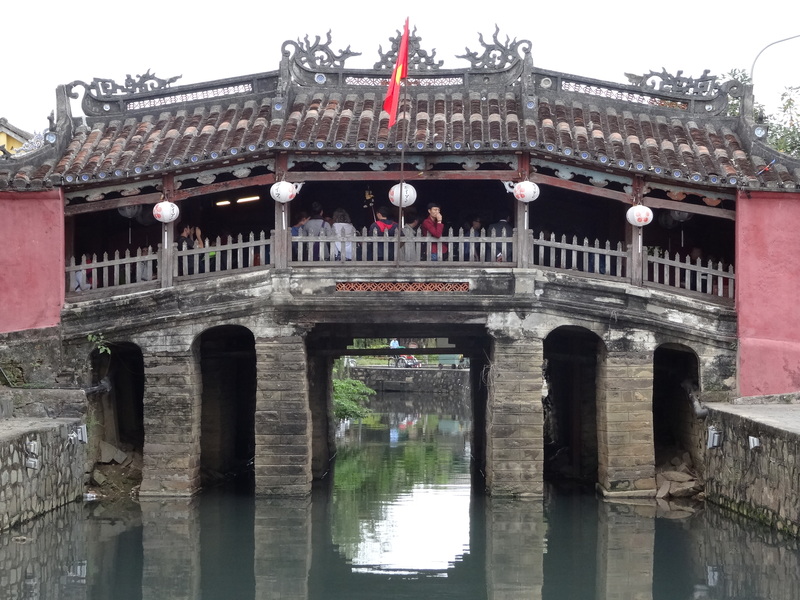 While in Hue, Carla and I explored the city, visiting the elaborately decorated UNESCO-designated Citadel, a walled fortress with a moat protecting the former imperial palace. While I enjoyed the southern half of Vietnam, especially since I got to met and hang out with new Vietnamese friends, I was ready to finally see the limestone cliffs and high mountains of northern Vietnam. From Dong Hoi, Carla and I took a bus to the small village of Son Trach to explore Phong Nha-Kẻ Bàng National Park, a UNESCO World Heritage site created to protect one of the world’s two largest karst regions with 300 caves and grottoes and its associated forest ecosystem. Per Wikipedia, the park contains the world’s largest cave, Sơn Đoòng Cave, with the largest chamber measuring more than 3mi (5 km) in length, 656 ft (200 m) high and 492 ft (150 m) wide. We explored the park on the back of motorbikes driven by two local gentlemen with the Phong Nha Easy Riders. The drive through the densely forested valleys and underneath the dramatic limestone cliffs was beautiful. It’s easy to see why the latest King Kong movie is currently being filmed there. While we didn’t visit the world’s largest cave, we did explore one of the park’s many caves, Paradise Cave. Caves are always cool! After saying farewell to Carla, I took a bus to the small village of Tam Coc. After almost one month in Vietnam staying mostly in hostel dorms (and one high school dorm), I booked a private bungalow at a tiny hotel nestled between rice fields and giant limestone cliffs. While I had to stay bundled up to keep warm in my bamboo-walled bungalow, it was a perfect place to relax and enjoy some personal time. I enjoyed it so much, I ended up staying there for 7 days during which I wrote in my journal, read, sorted pictures, watched movies on my tablet, talked to friends and family back home, and just chilled. A few nights, I joined other hotel guests for dinner, and copious amounts of local rice wine, hosted by the hotel owners and their family, adding to the wonderful, homey feel of the small hotel. 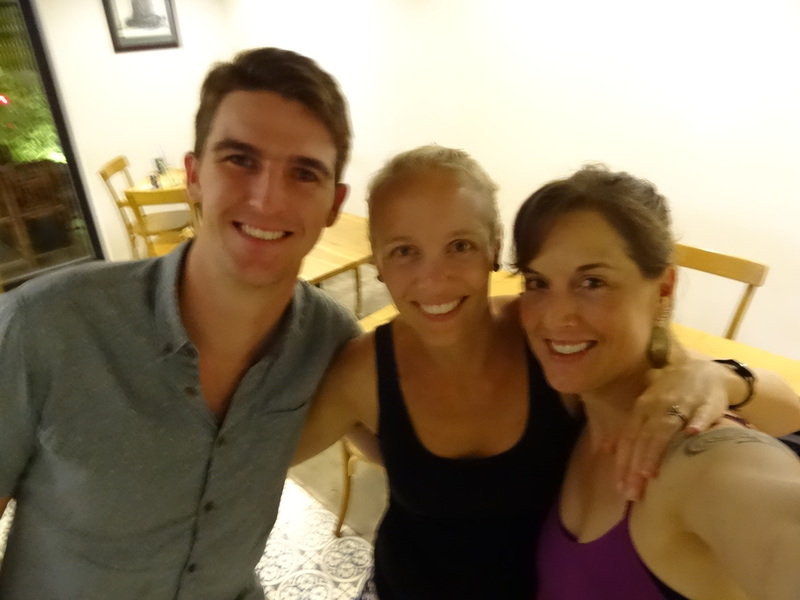 While there, I met a few other travelers, including Brett and Laura (UK) who I ended up traveling with for the remainder of my time in Vietnam. Now re-engerized, I took a bus-ferry-bus with Brett and Laura to Cat Ba Island (population 17,000, of which 4,000 live on floating fishing villages off the coast). I went to the island specifically to tour Ha Long Bay, a UNESCO site known for its thousands of towering limestone islands of various sizes jutting out of the ocean. However, other travelers had advised me that Cat Ba was an better alternative to the super touristy Ha Long City, the typical base for Ha Long Bay tours. And they were right! While tours from Cat Ba go to Lan Ha Bay, adjacent to Ha Long Bay, given the similar geology, I imagine that the thousands of towering limestone islands I saw jutting from the ocean in Lan Ha Bay were equally breathtaking. During our boat tour, Brett, Laura, and I admired the dramatic scenery, kayaked around the formations, and wondered about life on one of the many floating fishing villages we passed throughout the day. While on the island, we also explored Cat Ba National Park, home of the endangered langur, a small monkey only found on the island. While we didn’t see the elusive langur (whose babies have orange fur), we had a great day hike through their densely forested jungle. During our 7 day stay on the slow-paced island, we enjoyed good food, cheap beer, and more chill time. From the island, we took a bus-ferry-bus to Hanoi, Vietnam’s capital city (population 7,587,800) where we ended up staying for 11 days, mainly because of the processing time to get our Chinese visas (next designation) but also because we were enjoying the wide variety of good, cheap food. While I’d heard from many travelers that Hanoi was noisier, more crowded, and had worse traffic then Ho Chi Minh City, I found the opposite to be true and enjoyed what I felt was the more leisurely paced large city. Besides visiting the markets, eating good street food, drinking cheap beer, (and walking to and from the Chinese Embassy multiple times), we also enjoyed some cultural entertainment and saw a water puppet show. Per Wikipedia, the tradition of water puppetry dates back to the 11th century when it originated in the villages of the Red River Delta area of northern Vietnam. The shows are performed in a waist-deep pool with wood puppets attached to a large bamboo rod under the water used by the puppeteers, who are normally hidden behind a screen, to control them. Thus the puppets appear to be moving over the water. When the rice fields would flood, the villagers would entertain each other using this form of puppet play. It was a great way to spend our last night in Hanoi. 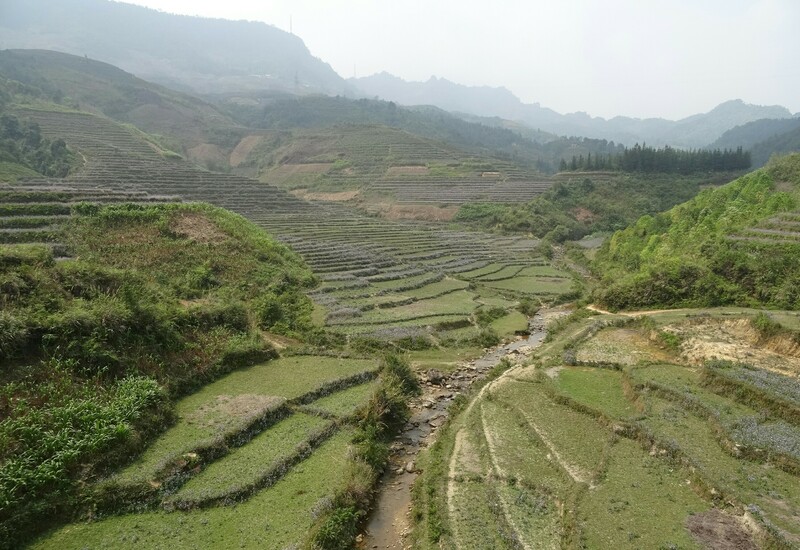 From there, we took a bus north to Ha Giang (population 71,689), located in the mountainous Ha Giang province where over 90% of the population are ethnic minorities. To explore this less frequented area located near the Chinese border, referred to as the last frontier, we rented motorbikes to do a self-guided tour. I’d been nervous to learn how to drive a motorbike up until now but for some reason became comfortable with the idea as a means to explore the mountainous, super curvey roads of northern Vietnam. Hmm… During my practice sessions in town, I lost control of my bike twice resulting in only a broken mirror and a scratched and bruised elbow and shin. With only minor damages to me and my bike, Brett, Laura, and I set off on a 4-day loop to Quan Ba, Yen Minh, Dong Van, Meo Vac, and back. 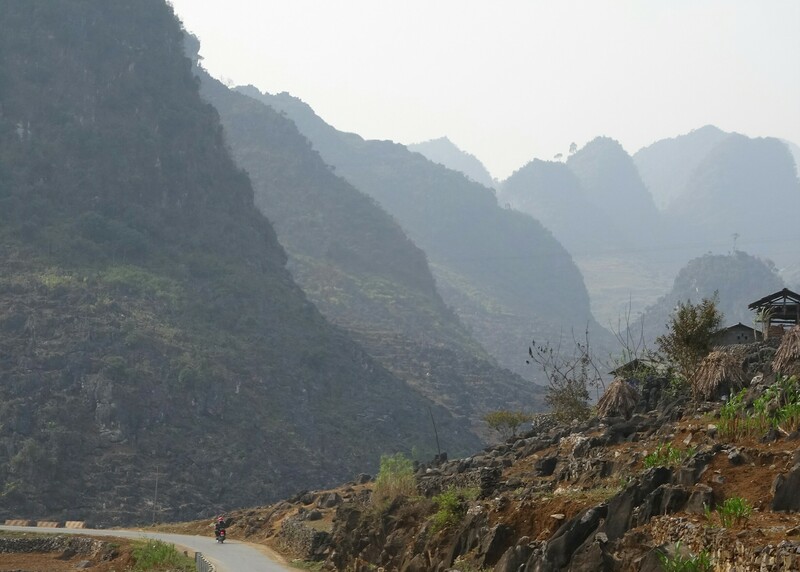 Most of the roughly 200-mi (320-km) loop is within the UNESCO Dong Van Global Karst Plateau Geopark, Vietnam’s first geological park, created in 2009 to (per the brochure) conserve the local heritage and environment through economic development that promotes eradication of hunger and reduction of poverty for upland people. The 906 sq mi (2,356 sq km) geopark has an average elevation of 4,593 ft (1,400 m) and is home to 17 different ethnic minorities. We made our way slowly and very cautiously along the two-lane road that took us up and down steep mountain passes, through gorgeous valleys, and passed many small villages. The scenery, as well as my confidence on the bike, improved with each passing mile. To explore the mountains of northern Vietnam, most tourists opt to visit the nearby town of Sapa intead of the Ha Giang province. As such, we saw few other travelers on the road or in the small villages and towns where we stopped. We were fortunate to be in the small town of Dong Van on a Sunday and enjoyed exploring the large Sunday Market, bustling with locals buying and selling livestock, clothes, household items, produce, spices, other goods, and cooked food. The market was particularly colorful due to masses of ethnic minority women and children dressed in traditional vibrantly-colored clothing. Driving through the amazing scenery and through numerous small villages made the road trip a particularly memorable experience. After returning unscathed to Ha Giang, we took a bus to Sapa (population 138,622), also near the Chinese border. While we’d been told it was super touristy, we wanted to see the town for ourselves. During the five days there, we experienced one clear, sunny day during which we enjoyed the view of the large valley below town and the surrounding mountains. The view on that sunny day along with the the plethora of shops and restaurants made Sapa feel like a lovely mountain resort town. Otherwise, it was very cold and the town was enveloped in its notorious thick, wet fog. (It was SF/Pacifica style fog.) In the cold, we bundled up and enjoyed walking around town, window shopping, and eating good food. Even in the dreary fog, the city center appeared vibrant due to the multitudes of ethnic minority women and children in their traditional colorful clothes selling their handicrafts. Sapa and the nearby border town of Lao Cai (94,192), where we spent our final night in Vietnam, were good last stops before leaving the country. Next designation: China. Vietnam is a beautiful country. I have to admit I wondered how locals would react to me as an American given the lingering effects of the American War, especially those associated with the use of agent orange. However, people were generally friendly and the topic of the war was never brought up. In fact, people often seemed more eager to talk with me once I told them I’m American. 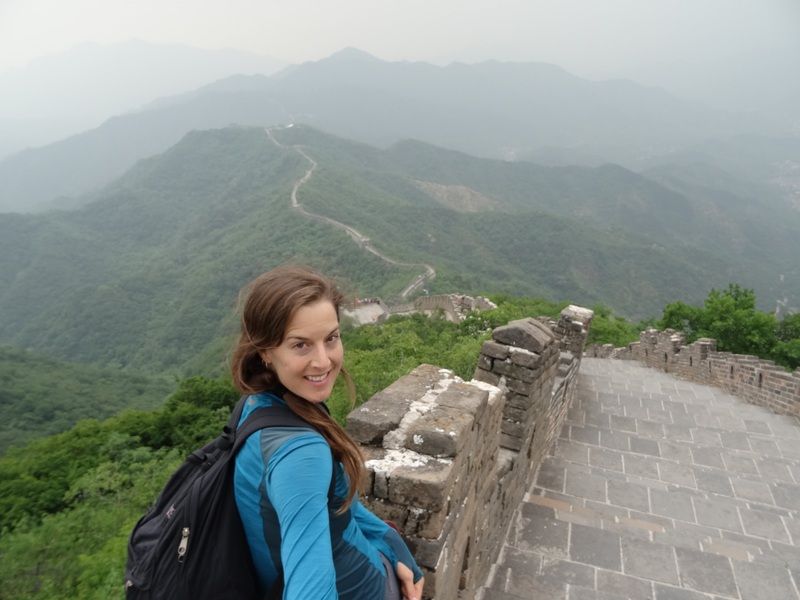 My experience in Vietnam was educational, interesting, and fun, and was made even more memorable by the wonderful people, Vietnamese and fellow travelers, with whom I shared it, especially Brett and Laura, my fun travel partners for the northern half of the country. 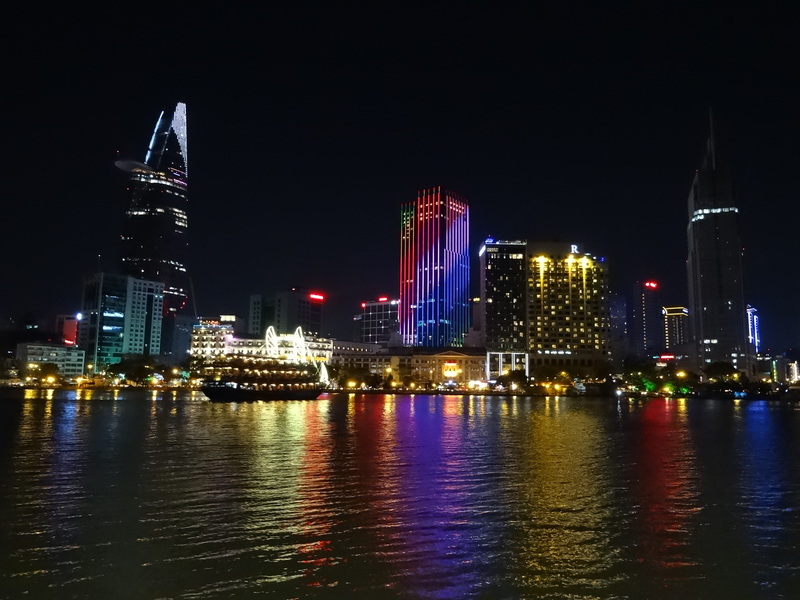 Ho Chi Minh City skyline. With Bart and Juliet in Ho Chi Minh City. Coffee at the floating market in the Mekong Delta. Happy Lunar New Year in Ho Chi Minh City with Andrea. 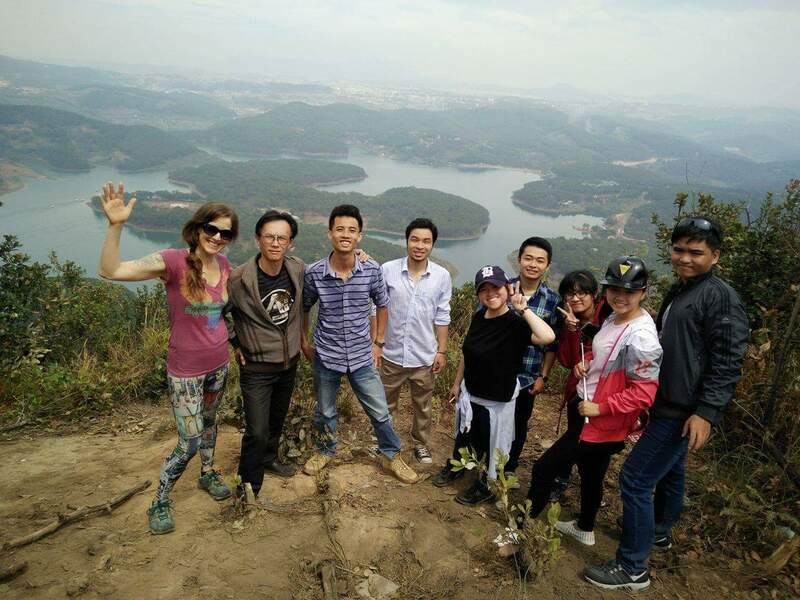 With Vien and new friends overlooking Dalat. 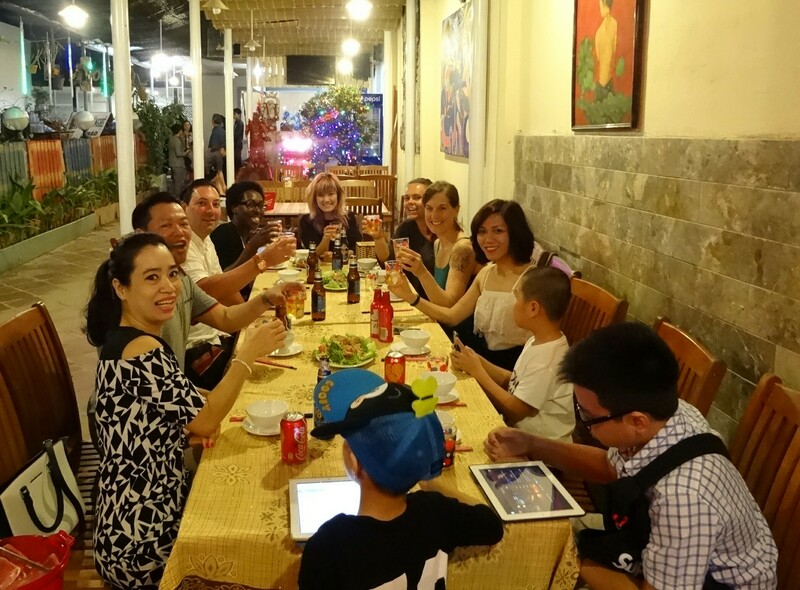 With Ly, Sheri, Lucy, Rich and new friends in Da Nang. 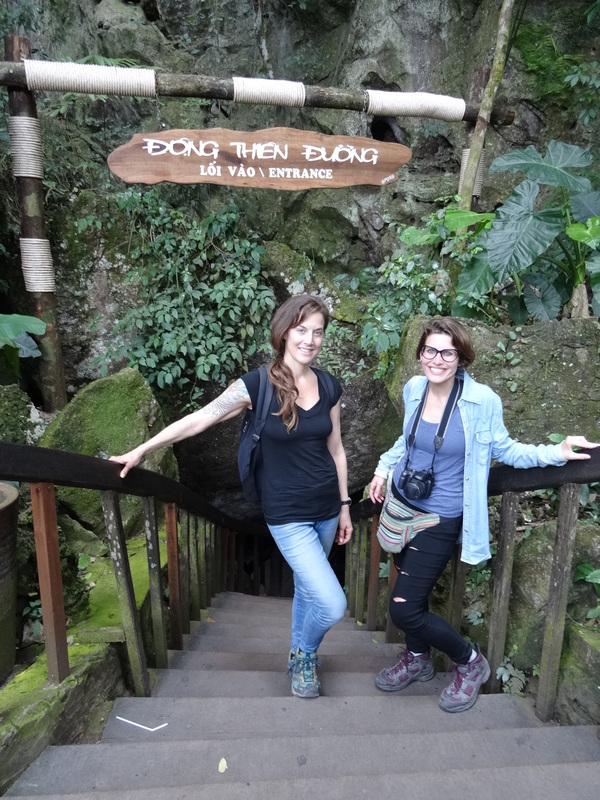 With Carla at Paradise Cave, Phong Nha National Park. 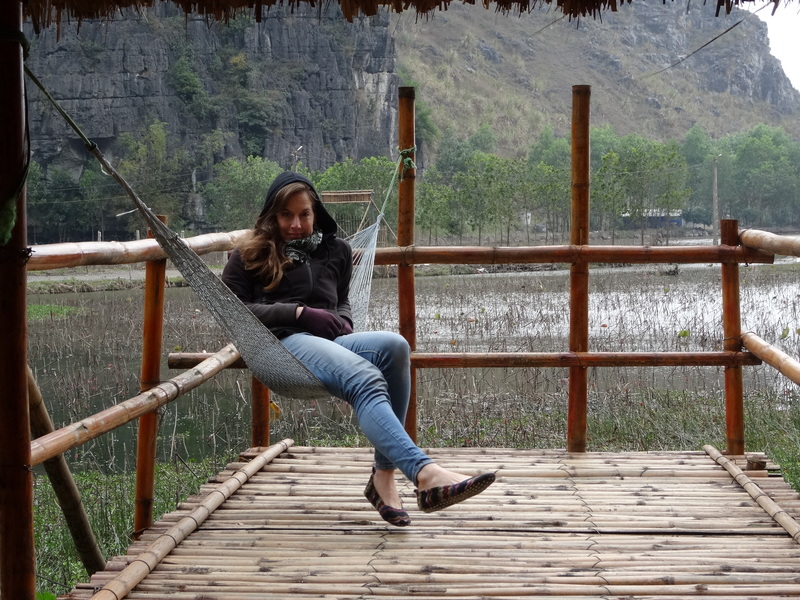 Chilling in my bungalow in Tam Coc. Floating fishing village in amazing Lan Ho Bay. 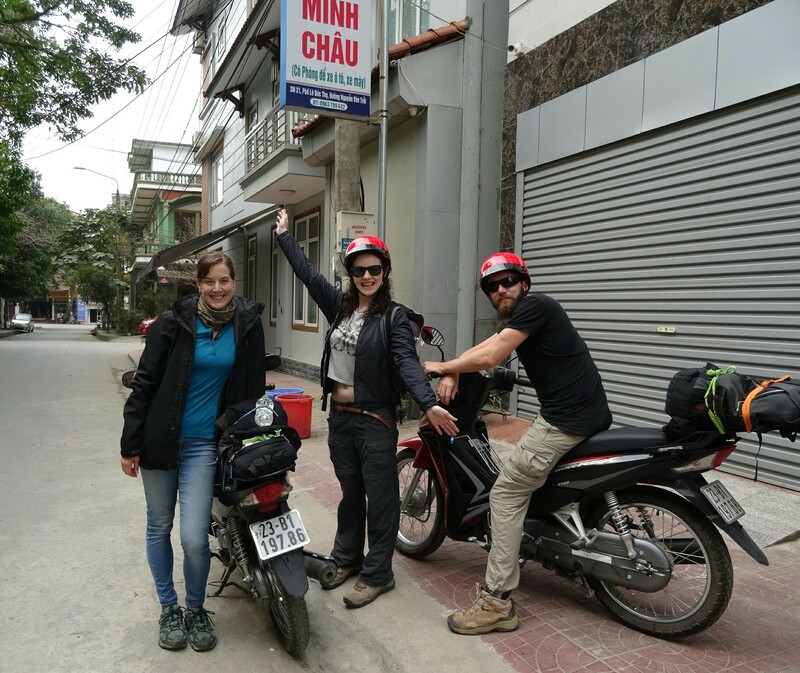 About to embark on a road trip in the Ha Giang province with Laura and Brett. Amazing view on road trip through Ha Giang province. 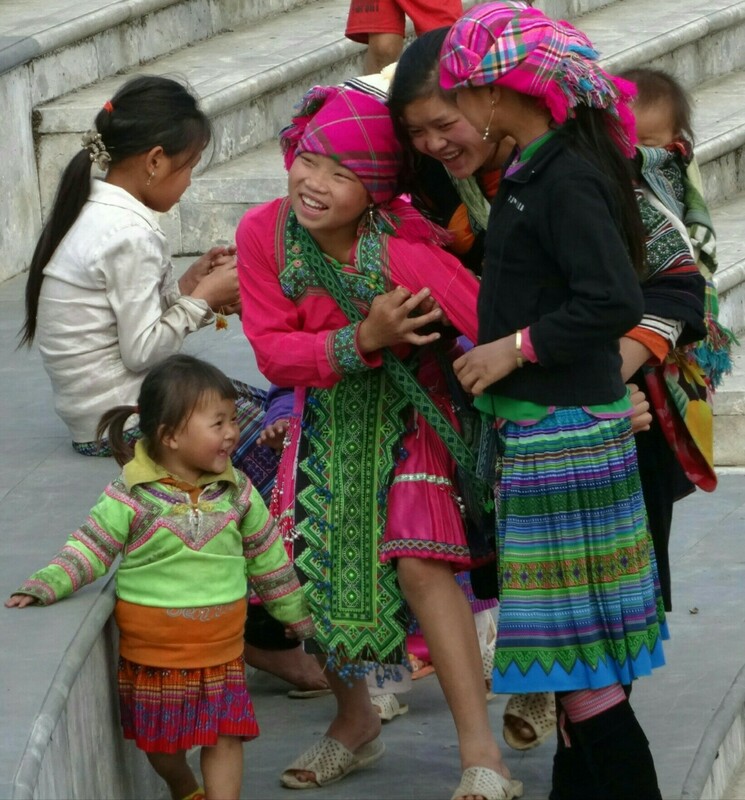 Beautiful smiles of kids in Sapa. 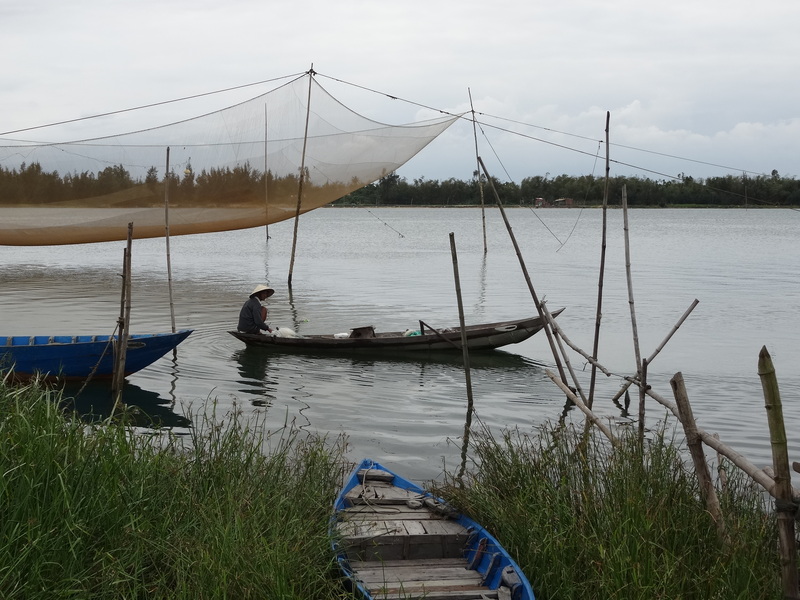 Fisherman on river near Hoi An.